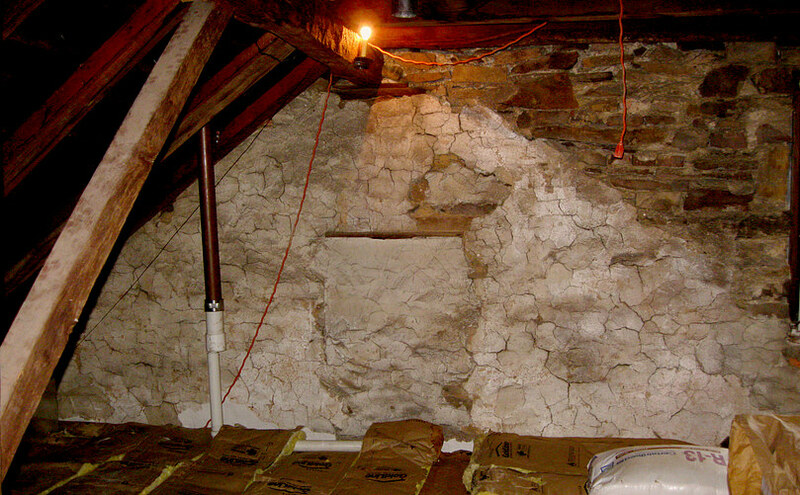 The top of the stone house as seen from inside the attic. This is facing the front. Top of the stone house facing the back. There is no indication that the log house was ever as high as the stone house. 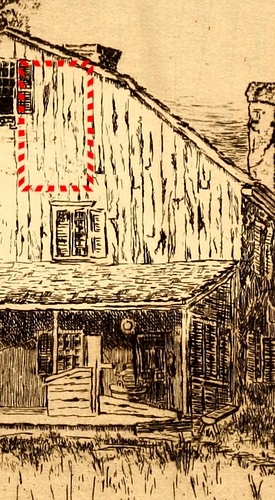 Inside the attic over the log house and the approximate location in the drawing. 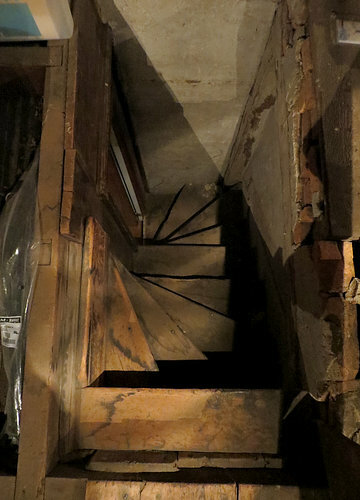 Looking down the attic steps. The steps were built over the log house and lead from an upstairs bedroom. later turned back 90 degrees with the addition of the top step. 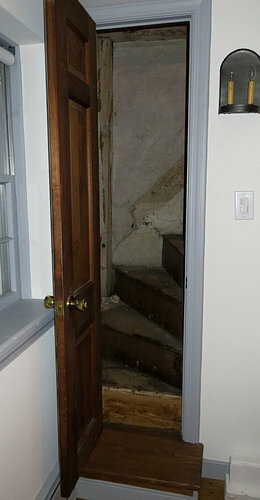 The doorway to the attic is only 16 inches wide. 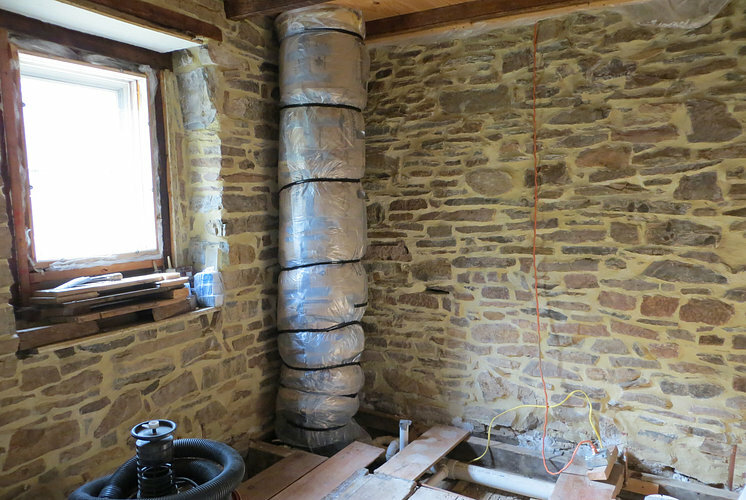 2nd floor, rear of the stone house under de-construction. This was all plastered. Someday it will be a bathroom. Over the stone was a "brown coat" consisting of mud, horsehair and lime. 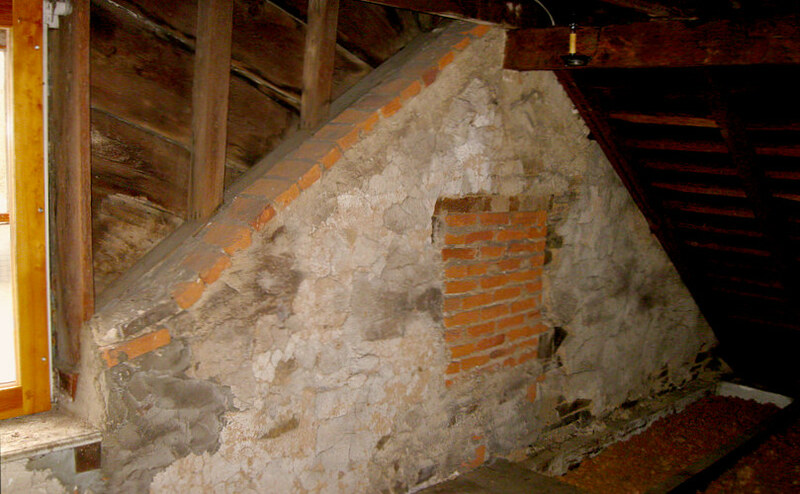 Over the brown coat was a layer of plaster. 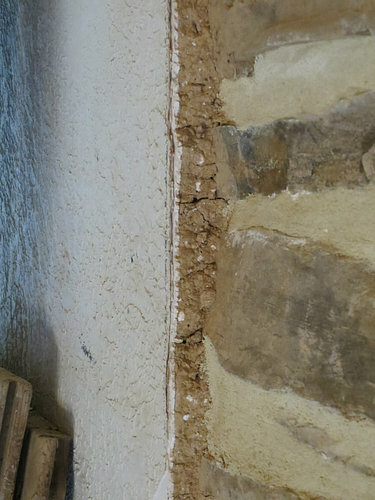 At some later date, someone thought an additional layer of "textured" plaster would be nice. This has all been chopped out and the stone has been pointed. 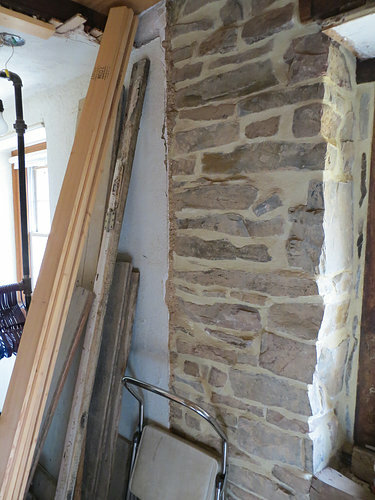 Was the brown coat applied and plastered over at the same time the stone house was built? 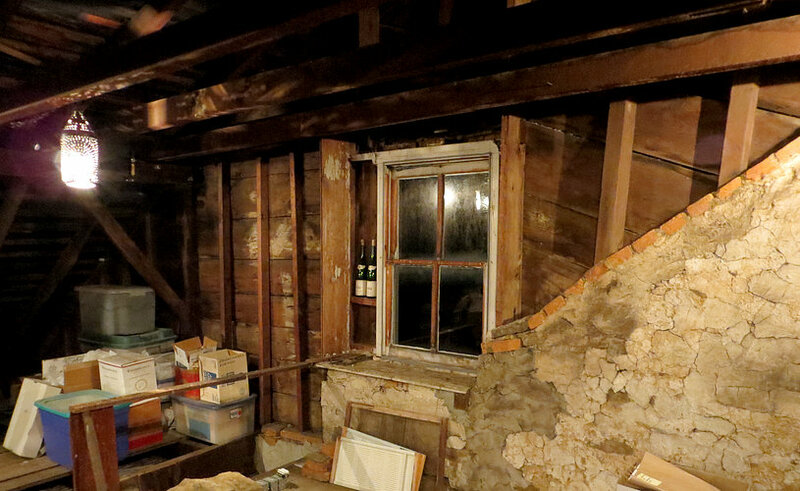 There seems to be plaster over the stones in the attic, but it's very rough. 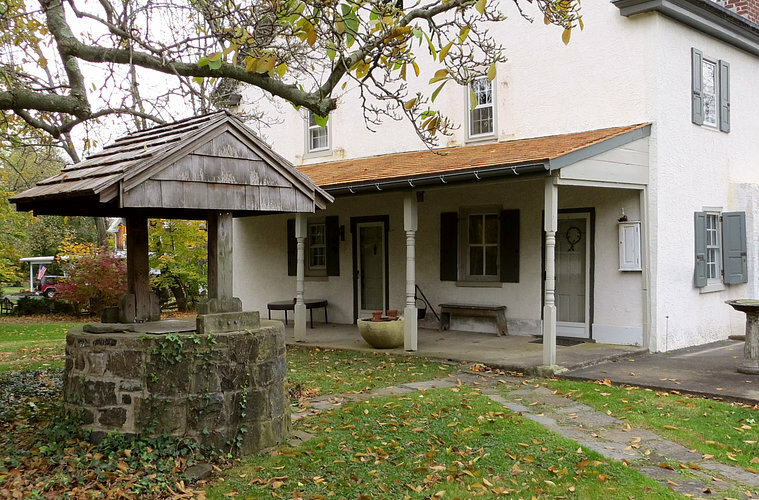 Thomas Evan (1698) Purchased Gwynedd Township with William John. Owen Evans (1715) son of Thomas Evan. 306 acres. Samuel Evans (1757) son of Owen Evans. Dr. Joseph Meredith (1814) Medical doctor, died in 1820. Sarah Lukens (1893) Same as above. Died 1900. Naylor Lukens (1897) Died 1910. A. H. Mueller Montgomery Co. North Penn Section 1916. Plate 29. West side of the house. This faces the barn. The barn, now a private residence. 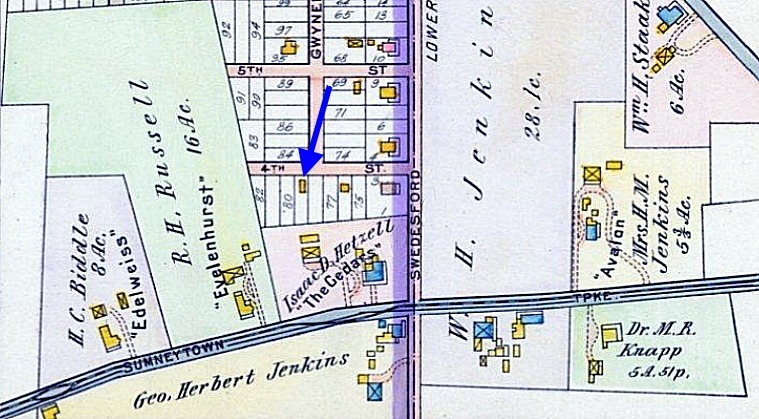 The Jenkins book refers to the area (in 1884) as "the Meredith farm" although John and Sarah Lukens had owned the property since at least 1871. 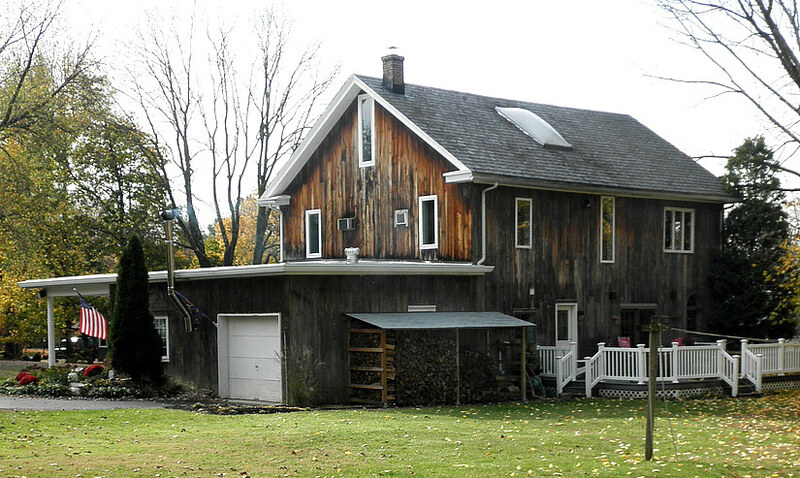 In 1885 Sarah Lukens had the house at the corner of Sumneytown Pike and Swedesford road built, along with this barn. Sometime before 1891 she sold the house and barn to Joseph Roehm. The map above (Baist map of Montgomery County 1891, Plate 11) shows that by 1891 Sarah Lukens, who still owned 62 acres, had sold the corner house and the barn to Joseph Roehm. 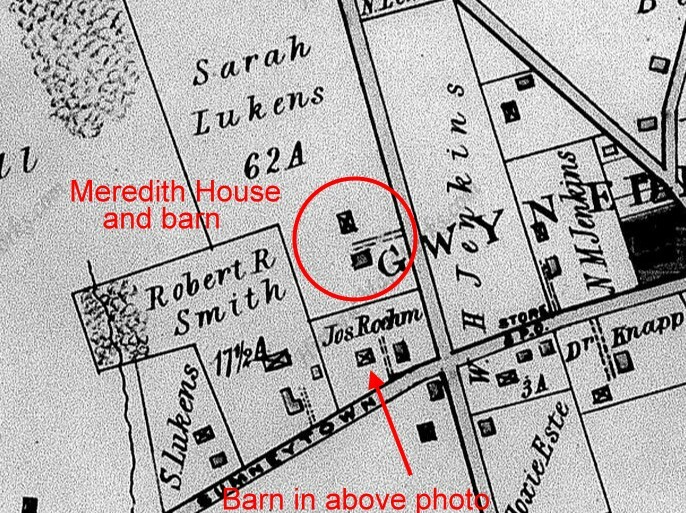 There is another barn on Sarah Luken's property connected to the Meredith House. Today there is a residence at the site of this barn. 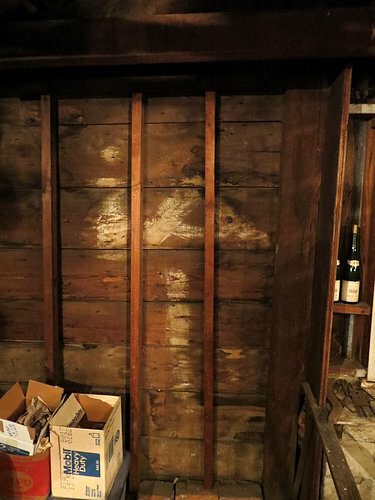 The owner occasionally digs up an artifact in his back yard. To complicate things there is another Lukens property at the bottom-left side of the map. This house was built by the Lukens in 1875. 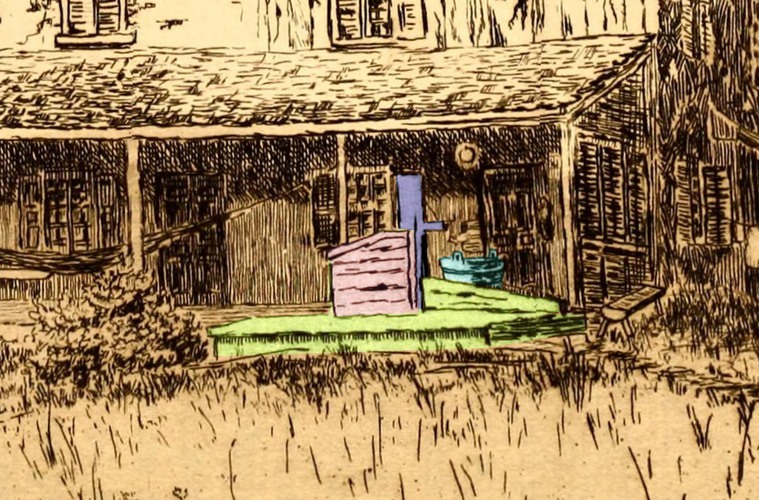 The beautiful house is still there today, along with the barn, at the corner of Sumneytown Pike and Barberry Road. Jonathan Lukens owned a saw mill and 90 acres of timber on West Point Pike. He built a train station on the Pike when the Stony Creek Rail Road came through in 1875, and for several years the village that sprang up in the area was known as "Lukens Station." When a post office opened there in 1878 the name of the village officially became "West Point". Lukens sold the saw mill that same year. 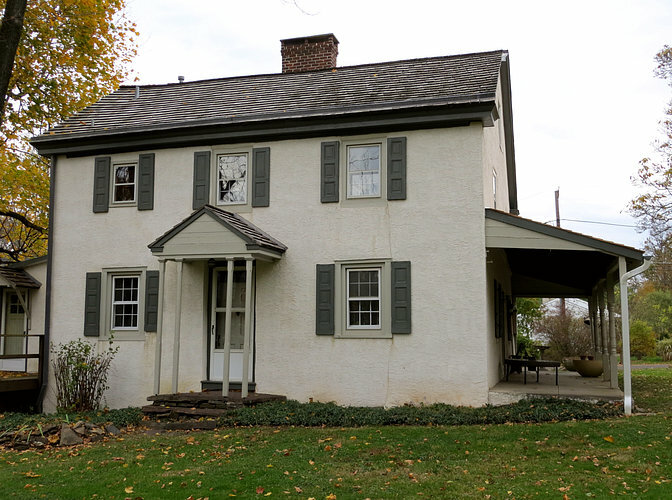 He owned a large tract of land in what is known today as Ambler. Many of the streets in Ambler were laid out by Lukens, who also built some of the first houses there. Jonathan Lukens died in 1884. Sarah died in 1900. They had a son named Naylor, which was also the name of Sarah's father. (See list of owners above.) Naylor died in 1910. The location of his death is listed as "North Wales," so we might assume he still lived in the house or at least owned it. The 1916 A. H. Mueller map (Plate 29) shows the corner property to be owned by Isaac Hetzell. Hetzell named his property "The Cedars." There are still one or two cedar trees on the property, descendants of Hetzell's cedars. According to the Mueller map, by 1916 Owen Evans' 306 acre property had been reduced to a measly 6.5 acres. At that time it was owned by Lester B. Johnson who subdivided it into 250 lots, surveyed in 1909. However, 110 years later there are only about twenty properties in the immediate area. The Meredith lots are numbers 76 to 82, stated on the deed for the house. Presently, the barn, Hertzell's house on the corner and the Meredith house are all individual lots separated by fences and shrubbery. 5th Street was never built and is now a line of trees growing between Gwynedd Avenue and Swedesford Road.. The well (and a bucket). I'm not sure what the wooden box is for. 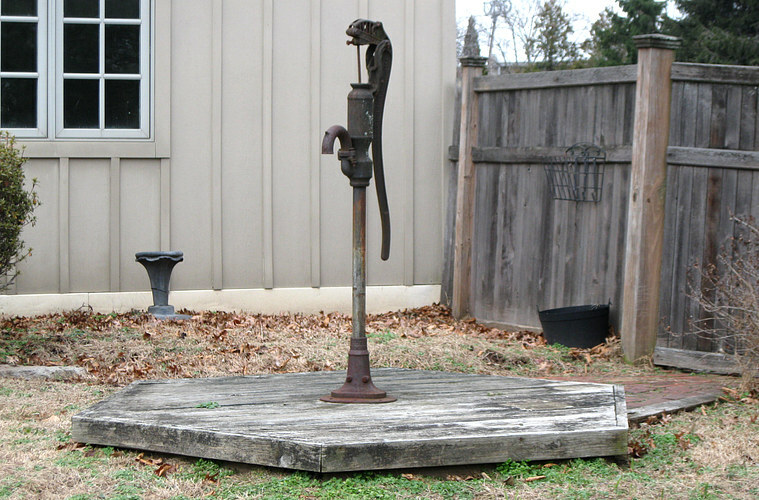 Roughly rendered in the drawing, the well cover and pump may have resembled this one. This is located in West Point, PA, about three miles distant. Here's another one, also in West Point. Notice the bucket in the background. The still functioning well is less than 20 feet from the front door of the log house. 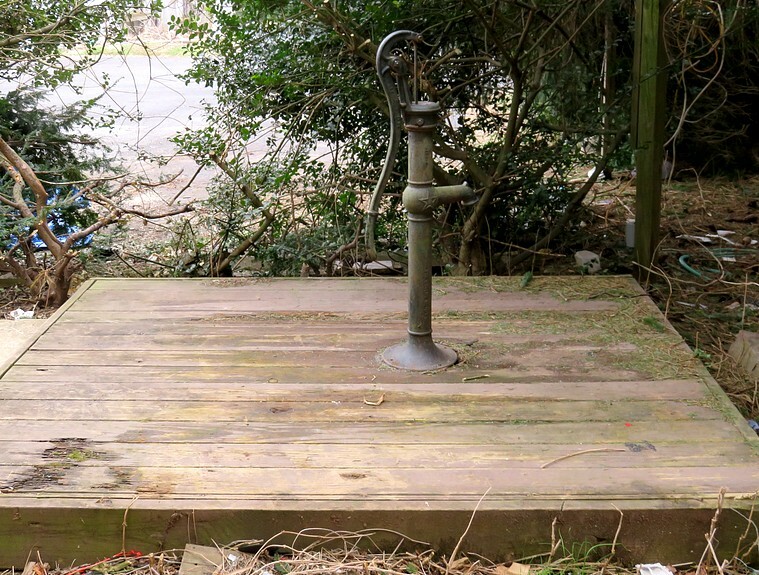 A metal plate is padlocked to the top to prevent the disappearance of neighborhood children.